Either a rebadged Atlas, or a semi-clone manufactured in Australia, the Austolite shaper appears to have been produced in the workshops of Fred Price Pty. Ltd. (Fred Price Engineering) of 69 Barry Street in the Melbourne suburb of Carlton. Although the firm was removed from the Companies Register as late as 1977, the likelihood is that they had ceased trading many years before. It is known that Price had made other shapers, including a much larger model during WW2. 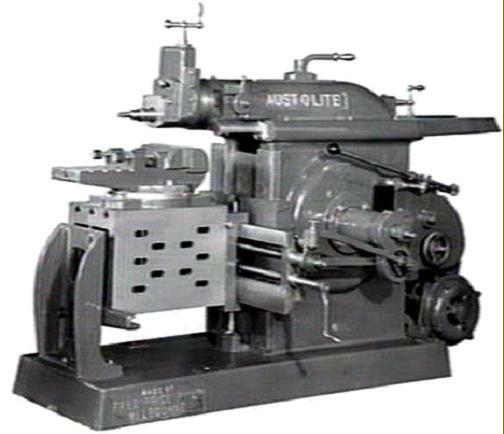 Although the general design and layout of the Austolite followed that of the Atlas there were some differences: the stroke-position adjuster handwheel (positioned at the rear of the ram) act appears to act directly on a screw instead of through a bevel gear as on the original and the main ram has dovetail instead of rectangular ways. The latter change might have been influenced by the need, on the Atlas, to shim out any wear in two directions - horizontal and vertical - while the dovetail ways of the Austolite are simultaneously adjusted in both directions, so getting rid of play very easily and quickly. In addition, the vertical adjustment on the Atlas involved partial disassembly of the horizontal "retainer bar" and the removal of shims strips from a multi-layer soldered master shim followed by reassembly and testing. The number of shims to be removed had to be guessed at and, as a result, the set-up could take some time and patience to get right. Another advantage of the dovetail ways was the ability to give them a temporary close fit when taking a "tough cut" - something that was impossible on the Atlas. On the example shown below a Myford leadscrew handwheel has been fitted to the table-traverse feed screw. If any readers can throw further light on the origins of the Fred Price Company and their machine-tool products, the writer would be pleased to hear from you..